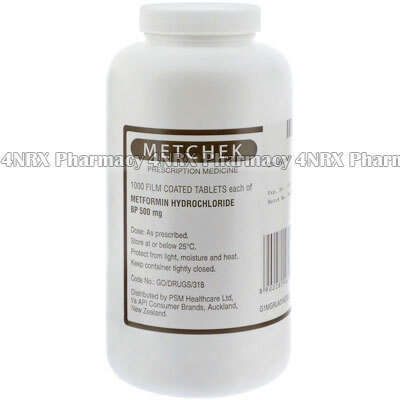 What is Metchek (Metformin Hydrochloride) used for? How should I use Metchek (Metformin Hydrochloride)? Most people will achieve diabetic control on a dosage of 500mg once or twice a day. The maximum recommended dosage is 100mg three times a day. It is best to take the lowest possible dosage at which hyperglycaemia can be controlled. Metformin will be taken in combination therapy with insulin and/or sulphonylurea. What are the side effects of Metchek (Metformin Hydrochloride)? If you develop and allergic reaction to Metformin (hives; difficult breathing; swelling of your face, lips, tongue, or throat) contact a doctor. Use of metformin by pregnant women or nursing mothers is not recommended unless specifically advised by a doctor.